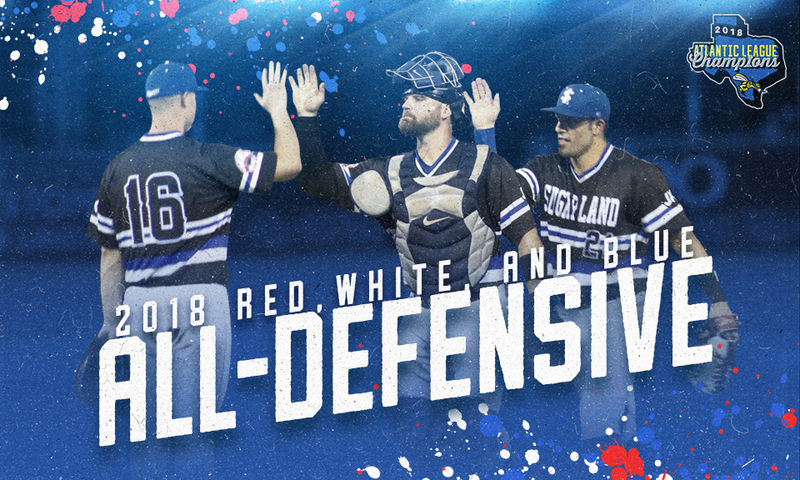 SUGAR LAND, TX— The Atlantic League of Professional Baseball today announced that Sugar Land Skeeters first baseman Matt Chavez, outfielder Anthony Giansanti and catcher Derek Norris were named to the Red, White and Blue All-Defensive Team. The postseason accolades continued for Chavez and Giansanti, who along with right-hander Felipe Paulino, were selected Tuesday as Atlantic League Postseason All-Stars. Chavez, 29, was a symbol of consistency at first base for the Skeeters, appearing in 100 games at the position, which were 11 more games than any other player in the league. In his first season with the Skeeters, Chavez was selected to the Atlantic League All-Star Game, selected as a Postseason All-Star and has now been named to the league’s All-Defensive team. Chavez accounted for an Atlantic League-leading 867 putouts on the year — 73 more than any other player in the league. Giansanti, 30, established himself as one of the league’s most versatile players, along with being a premiere defender in center field. Giansanti appeared in 68 games at center field in 2018, as well as 40 appearances at second base, 13 appearances at left field, four appearances at right field and two appearances at third base. Giansanti was one of two players in the league to make at least 40 appearances in the outfield and the infield, joining Somerset’s Mike Fransoso. Giansanti led the Skeeters with 122 games played, also placing him in a tie for fourth in the league. Norris, 29, led the Atlantic League with 89 appearances at catcher, 13 more appearances at the position than any other catcher in the league. Norris committed just three errors as a catcher, placing him in a tie for second amongst catchers in the league with at least 50 appearances. With Norris behind the plate for the bulk of 2018, the Skeeters led the league with a 3.14 ERA, which was the lowest single-season team ERA in Skeeters history. Left-hander James Russell also became the first pitcher in Skeeters history to win the league’s ERA title, finishing the year with a 2.36 ERA. The Skeeters won their second Atlantic League Championship in franchise history in 2018, beating the Long Island Ducks in five games in the best-of-five Atlantic League Championship Series. The team had 12 contracts purchased by Major League Baseball Organizations and 14 total contracts purchased by outside professional baseball organizations, which were both Skeeters single-season records. Since the Skeeters joined the Atlantic League in 2012, the Ducks are the only other team to win at least two league titles.